Olivier Giroud has perhaps been one of the most underrated players during his time at Arsenal but did manage to build a strong reputation for bagging crucial goals as well as his ability to hold up the play as he brilliantly showed his critics in Russia. And now statistics have come out in the open which shows the tremendous effect the 31-year-old has had on one of his Chelsea teammates. According to this graphic released by Sky Sports, the World Cup winner plays a vital role in star man Eden Hazard finding the net. The Belgian winger has found the net 9 times when playing with Giroud and just once without him in all competitions for Chelsea. Unsurprisingly Giroud started for Sarri during the 4-1 rout against Cardiff City in which Hazard bagged his first hat-trick since 2014. 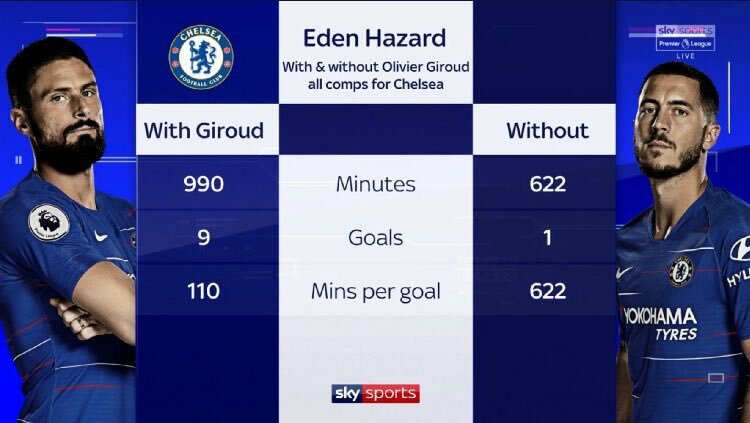 Numbers certainly don’t lie and the data points to Giroud’s growing influence on Hazard’s goal-scoring abilities and as their chemistry continues to grow over the season, Blues fans should be bracing themselves for a stellar season from the Belgian.